For those of you who may consider day trading, realize it is not for everyone. There are risks and rewards associated to the game, and like any game, there are winners and losers. Some numbers I have seen floated about suggest that less than 5% of traders make money. Another report suggests that upwards of 20% make money. For a more structured example of what it takes, there is this article from BigTrends.com. Often times traders lose so much money they are not around to continue. Other times, traders do not take enough risk and limit their upside potential. Marches formed this past Saturday in 52 different countries, including 436 different cities to protest Monsanto products and their impact on the global food supply. 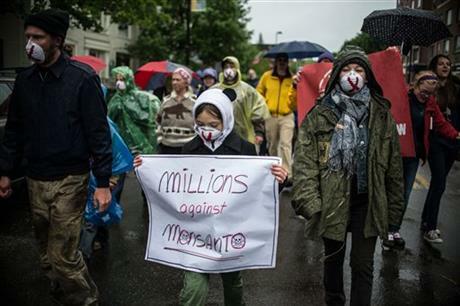 And these protesters are being identified by the Monsanto CEO as “elitists”. By the way, the CEO of Monsanto, who is calling these protesters elitists pocketed $14.4M in 2012. Although the pay limit is to max out at 200% of its annual target, the Monsanto board voted to extend Mr. Grant’s pay to 265% for 2012. One might call Mr. Hugh Grant an elitist. It appears that the Monsanto corporate objective to make money, is getting in the way of making friends. Their claim that they are solving the world’s hunger problems is questionable at best. Why is that so? You might ask. Since the introduction in the 1990’s, the companies that produce GMO products forbid the independent testing of their products, even on rats. One might think that something consumed globally would be worthy of making sure it was safe for “long term” human consumption. Patent laws are funny that way. Amphibians are dying off at an increasing rate. For people who study this issue, this is no news. Ever since the first anecdotal reports in the 1980’s occurred about declining frogs populations, the trend has continued. Causes are varied from the obvious loss of habitat from population expansion to a new fungus. 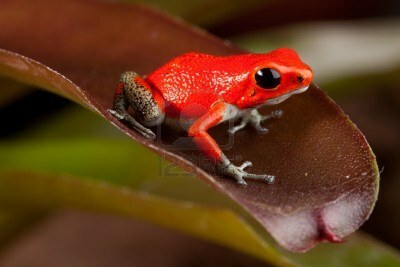 In Costa Rica last year I did see some very small, beautiful frogs. But in reality, nowhere in the world has the amphibian population decline been so evident. As amphibians spend part of their time in water, and part of their time on land, their decline is an indicator of the quality of their environment. After being on the planet for 350 million years, their survival is now at stake. There are still frogs on the golf courses in Ohio, but a very new study on amphibian populations in the US confirms the worldwide decline. Vernon Hershberger is a farmer in Wisconsin who raises dairy cattle in the best way that he sees fit. The cattle eat natural grass, are treated humanely, and have little or no hormones, etc. The grass is not treated with herbicides or weedkillers. What results is a healthy milk product that the local community claims is an important factor in their good health. Mr. Hershberger may be headed for jail. It appears that Mr. Hershberger is producing milk without a permit or license, and is being prosecuted by the state of Wisconsin. The trial began this week. It will be interesting to hear what the outcome is, and observe how much media coverage their is on the subject. 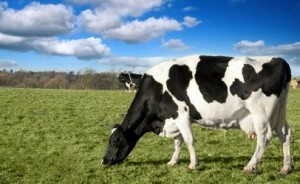 Update : 6/19/2013 – In the end, he was fined $1000, and the verdict on raw milk sales in Wisconsin remains an issue. Some people don’t realize that OTA (Over The Air) broadcast TV that originated in 1927 is still around. As most everyone uses cable today, why is there any interest in OTA TV? Well, for one, OTA TV is still free. In most parts of the country, and especially in the urban areas, stations like NBC, CBS, FOX, PBS, and ABC still broadcast. For a second reason, these stations can be viewed commercial free using some special hardware, software, and a PC or MAC. Hardware like an HDHomeRun, combined with a PC runnning BeyondTV. or similar software, can provide a wealth of entertainment value at a fraction of the cost of cable. Lately there has been some stir about an upstart company called Aereo who is trying to get between OTA viewers and the cable companies. Aereo is basically monetizing that HDHomeRun/ BeyondTV solution, and as such has upset the network broadcasters. They do not plan on sharing their revenue with the service providers, and therefore, the advertising budgets used to produce commercial TV is at risk. You are now starting to see more and more broadcasters going direct to the internet with programming. There is even an app for watching ESPN live on your smartphone, provided you currently are a customer of any one of several cable companies. Let’s hope this is not the beginning of the end for OTA broadcast television. Glyphosate You Say? How About Roundup? Glyphosate (Roundup) is the most widely used herbicide on the planet. It was initially used as a broad spectrum herbicide to kill weeds and other plants that threatened crops. The use of Glyphosate mushroomed when genetically modified seeds whose crops were resistant to glyphosate were introduced. The benefits seemed to outweigh any side effects at the time. The originator of the product says Roundup is only “minimally” toxic to humans, after all. Glyphosate was introduced in the 1970’s. Its patent expired in 2000. Today it is more widely used than ever, and its impact on the environment and mammals is becoming more and more apparent. Now that Superweeds (naturally developed) have become an issue, the chemical companies are developing another herbicide to replace glyphosate. And, of course, there is another batch of genetically modified seeds that will be resistant to the new herbicide. – Glyphosate is potentially teratogenic – i.e. causing fetal malformations. – Glyphosate may be responsible for many chronic illnesses as it attacks the gut bacteria in your stomach. – Dr. Nancy Swanson study relating glyphosate to chronic illness in the US. Europe is more in front of this issue than the US. And as everything on the internet, use some common sense in reviewing the information from these links. Be informed and aware of the issues with the prolific use of glyphosate, aka Roundup. Monsanto won a settlement against a small farmer this last week in Indiana. The farmer had bought genetically modified seed, grew crops with that seed, and used the excess seed for planting in future years. The judges in a unanimous ruling said he had violated patent law, which he did. The lawsuit has also expanded the FUD factor among organic farmers. FUD is that ever successful marketing campaign that stands for Fear, Uncertainty, and Doubt. The ultimate goal of Monsanto is to replace all natural seed with their “patented seeds”, genetically modified of course. And along with that, produce matching “patented” pesticides designed specifically to be sprayed on the resulting crops. And to further that effort and to maximize profits, produce seed that is incapable of generating useful seed from its crops. So, every year, every farmer in the world would have to pay Monsanto for their seed, or not be able to grow crops. That is if Monsanto achieves its goal. I encourage you to watch The World According to Monsanto. Another tactic used to further expand its market since 1997, has been to take small farmers to court. (An official explanation from Monsanto is available online.) These farmers may simply have been trying to grow organic produce, while surrounded by fields of genetically modified crops. Seed from the GMO fields drift onto the organic land. The contaminated fields are sampled for GMO plants. Once the GMO plants are found, Monsanto sues the farmer. You can imagine the ability of a small farmer to defend from such litigation. Most farmers simply back down, or sell out. If you think the chemical companies are not being successful in displacing mother nature, check out an article from Mother Jones. If you think that we don’t fully understand what GMO products are doing to our bodies, don’t read it. If you want to jump on the profit margins from this world changing strategy, go long MON, DD, and DOW.